Snow was abundant in New York City this month. In fact, it was one of our top ten snowiest Januarys ever. In Central Park, the city received 19.7 inches of snow this month. That is 12.7 inches above average. 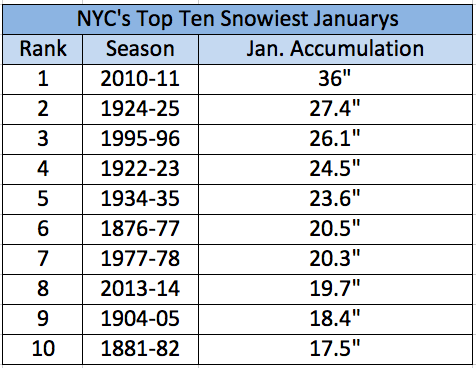 According to the NWS, that makes January 2014 the Big Apple’s 8th snowiest January on record. It is also a significant departure from last January when the city only accumulated 1.5 inches for the month. The weather system that clobbered the Deep South yesterday also delivered a glancing blow of wintry precipitation to New York City. The NWS reported a dusting of 0.8 inches of snow in Central Park. Courtesy of a prolonged cold snap, this modest accumulation fell on top of the snow cover still in place from our last major storm. 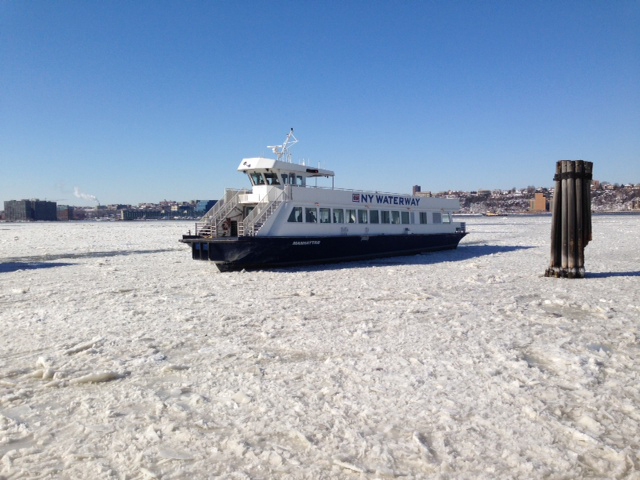 For some winter weary New Yorkers, it was too much. 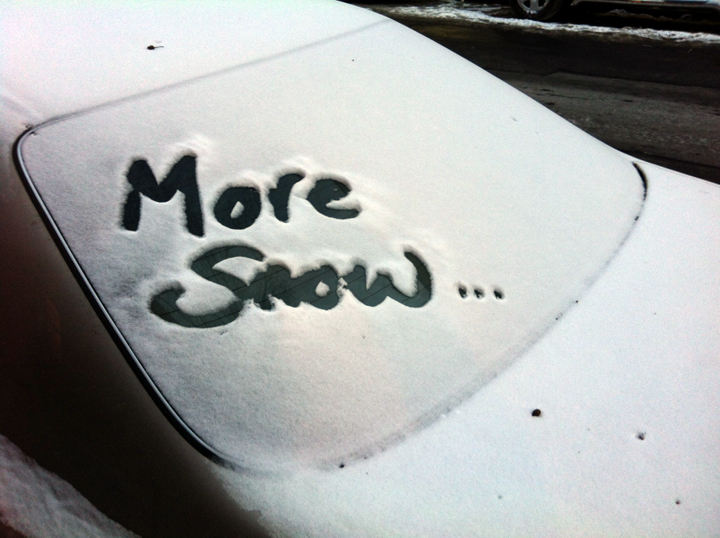 Message written on a snow covered car in mid-town Manhattan. Image Credit: The Weather Gamut. A rare winter storm paralyzed large sections of the southeastern United States yesterday. Serious impacts from snow, sleet, and freezing rain were felt from the Gulf Coast to Virginia. According to the NWS, 2.6 inches of snow fell in Atlanta, GA – a new daily record for the region’s largest city. As a whole, the Deep South is not accustomed to wintry precipitation and most cities and towns are not equipped to deal it. Salt spreaders and snowplows are in short supply across the region. As a result, major roads turned into sheets of ice creating very hazardous travel conditions. The timing of the storm made the situation even worse. Arriving in the afternoon, many people were caught on the roads trying to make their way home. 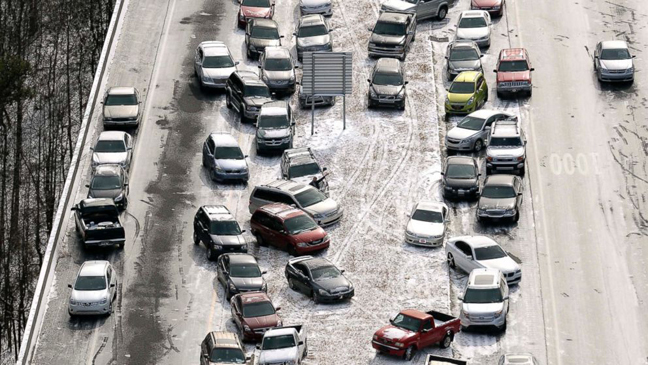 Officials have reported hundreds of traffic accidents and stranded vehicles. Many people were even forced to shelter in place overnight in cars, schools, and stores. Temperatures across most of the United States in 2013 were relatively moderate. Globally, however, it was an exceptionally warm year. According to NOAA, 2013 is now tied with 2003 as the fourth warmest year ever recorded on this planet. Earth’s combined average temperature for the year – over both land and sea surfaces – was 58.12°F. That is 1.12°F above the 20th century average. 2013 also marked the 37th consecutive year that our global temperature was above its long-term norm. While heat dominated most of the planet, Australia was particularly warm. With a mean annual temperature of 71.2°F (2.2°F above average), 2013 was their warmest year on record. Japan and South Korea also experienced their hottest summers ever. With records going back to 1880, Earth’s top ten warmest years have all occurred since 1998. To date, our warmest year was 2010. Persistent frigid temperatures have been gripping a large part of the United States recently. In these conditions it is important to remember that, like extreme heat, extreme cold can be very dangerous. Frostbite is a localized injury to the skin and underlying tissues caused by freezing. It can cause permanent damage and extreme cases often require amputation. Areas of the body most often affected include the nose, ears, cheeks, fingers and toes. 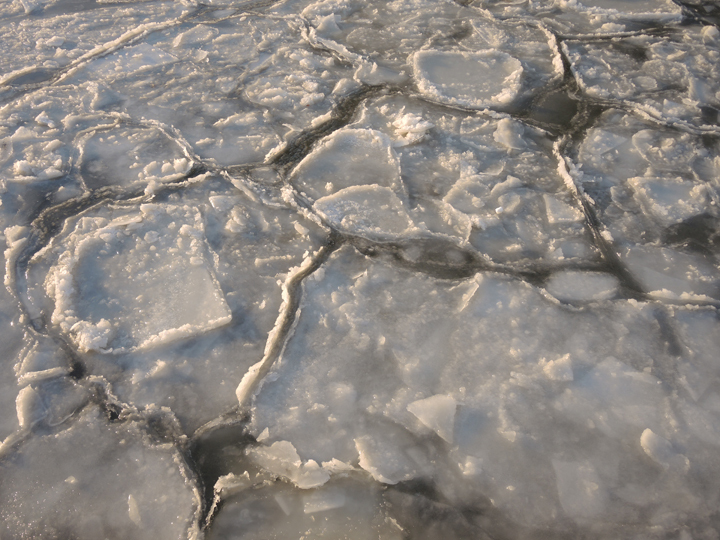 Signs of frostbite include, numbness, skin discoloration (white or greyish-yellow), and unusually firm or waxy feeling skin. A major winter storm dumped heavy snow from the Mid-Atlantic states to New England yesterday. With some areas getting more than a foot of accumulation, records fell across the region. Here in New York City, we received 11 inches of powdery snow in Central Park. That is a new snowfall record for the date, according to the NWS. The previous record of 6 inches was set in 2001. The city’s snow total for the month is now 17.4 inches. On average, we normally get 7 inches for the entire month of January. Moving in from the mid-west, this storm started out as an Alberta Clipper. This type of system does not typically produce much snow, as it originates over land. This one, however, intensified when it reached the eastern seaboard and morphed into a nor’easter with heavy precipitation. 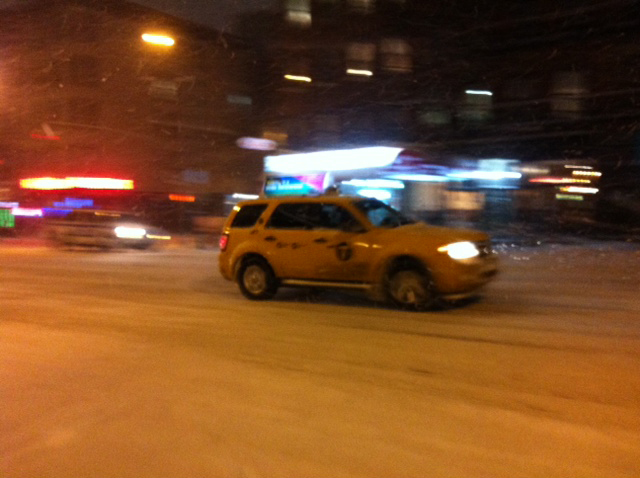 NYC taxi making its way through heavy snowfall. Image Credit: The Weather Gamut. Heavy snow is forecast to blanket the east coast from Virginia to Maine later today. As the storm passes, temperatures are expected to plummet. A weakened polar vortex has allowed frigid arctic air to push southward for the second time this month. Temperatures are likely to drop below freezing as far south as northern Florida. The core of the cold, however, will be centered in the mid-west and northeast. Here in NYC, daily high temperatures are forecast to be 15°F to 20°F below average for the remainder of the week. While conditions are not expected to be as brutal as they were during the last arctic outbreak, the frigid weather will linger this time. Today’s snow will likely stick around for awhile. Oppressive heat has been gripping southeastern Australia for days. While it is summer there and high temperatures are expected, this heat has been extreme. In the state of Victoria, temperatures soared above 40°C – that is 104°F – for four consecutive days. In the neighboring state of South Australia, the mercury hit 44.2°C (112°F) in Adelaide – making it the hottest city in the world on Thursday. Officials say this intense heat has fueled wildfires, sent hundreds of people to the hospital with heat related illnesses, and caused widespread power outages. In Melbourne, it even caused play to be suspended at the Australian Open – a Grand Slam tennis tournament. Scorching heat waves seem to be getting more common in Australia. Last year, the country’s hottest on record, the Bureau of Meteorology had to add two new colors to their weather map to reflect the higher temperatures. This current heat wave is forecast to break over the weekend and a dramatic cool down is expected to follow. So far this winter, snow has been plentiful across the mid-west and northeastern US. 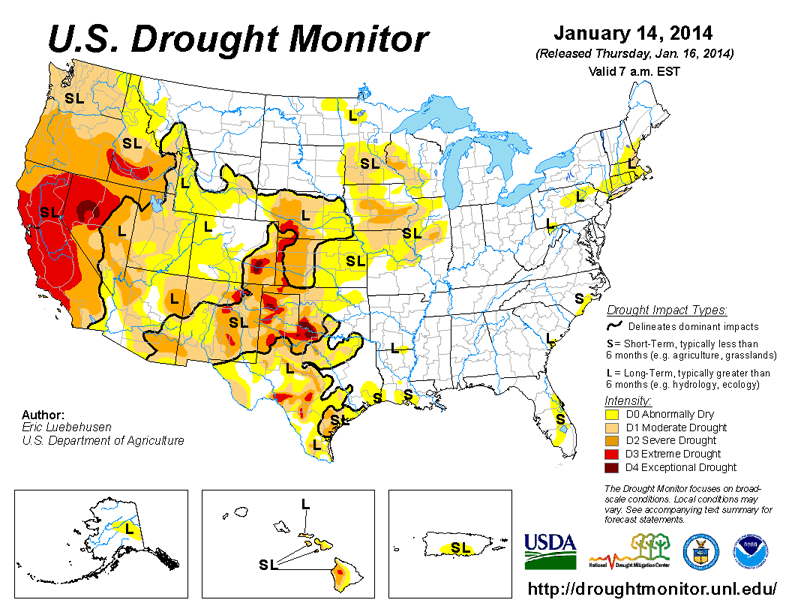 In the western states, however, long-term drought continues to leave much of the region parched. According to the latest report from the US Drought Monitor, 61% of the West is suffering under conditions of moderate drought. In California, where 2013 was their driest year on record, the situation has gone from bad to worse. In just this past week, the category of extreme drought jumped from 28% to 63% of the entire state. These dry conditions are not only lowering reservoir levels and reducing crop production, they are increasing the risk of wildfires. In fact, a large fire broke out today in the San Gabriel Mountains near Glendora, CA – a heavily populated suburb of Los Angeles. January is usually the wettest month of the year in southern California, but a persistent ridge of high pressure over the region has pushed the storm track north. Unfortunately, this dry weather pattern is forecast to remain in place for the near future.